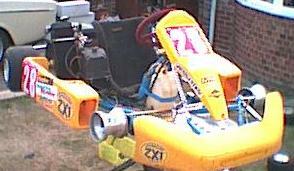 THE ENGINE IS AS NEW ONLY ONLY ONE TEST AND ONE RACE MEETING APROX TWO HOURS RUNNING TIME. This kart is all you need to start racing or race in the Junior Rotax class which has the biggest grids in the country, over 60 karts race in the British championship Super 1. For racing purposes this kart can be used by a 12-16 year old, but can be changed into a Senior engine to race in the senior rotax class(16+) by the engine supplier JAG , or it can be used by anybody for a bit of fun. It comes with an R3 system which goes on he steering wheel and measures the engine revs, water temperature and lap times. Contains a 100 lap log. Speed measurments in mph or kph, which alone is worth almost £200. It comes with many other spares including wheels, tyres (slicks and wets) sprockets and loads of other things.Its a great Kart. LRG is a top make of kart which has won many championships including the British Championship in the Junior Rotax max class. This package would cost £3500+ brand new. The engine alone is worth £1200. Kart has electric start so start at the touch of a button, no need for push start or pull cord. Comes with spare battery and charger. Buyer collects kart or pays postage. Can arrange to meet at a local circuit e.g. Buckmore Park (Chatham), Bayford Meadows (Sittingbourne) or Lydd International(Lydd, New Romney).